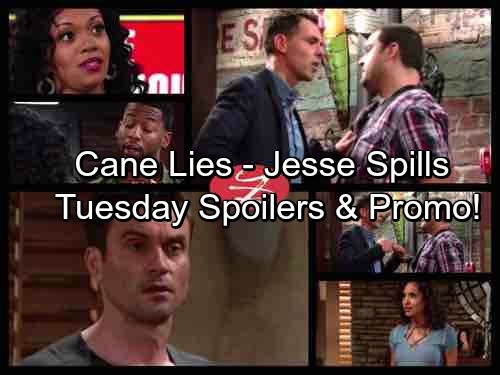 The Young and the Restless (Y&R) spoilers for Tuesday, August 1, tease that Billy (Jason Thompson) will urge Jesse (Max Adler) to come clean about what happened in Hollywood. At Brash and Sassy, Victoria (Amelia Heinle) will learn that Jesse may have useful information. She’ll offer to double what Cane (Daniel Goddard) paid if he’ll spill it. Billy will quickly add that the alternative is telling the cops. Jesse will admit that Cane was behind the whole thing. He was hoping to make Billy look bad with the scandalous editing. After handing over the footage, Jesse will try to collect his money. Instead, Victoria will put away her checkbook while Billy tosses Jesse out. Once that troublemaker is gone, they’ll head off to confront an even bigger troublemaker. At home, Lily (Christel Khalil) will demand some answers. She’ll want to know why Charlie (Noah Alexander Gerry) and Mattie’s (Lexie Stevenson) school account was drained. Cane will lie that he made an investment, but he’ll promise that he’s got everything under control. He’ll note that a brokerage fund can be liquidated to pay the twins’ tuition. Suddenly, Billy and Victoria will show up with crushing news for Lily. She’ll look stunned as Billy shouts that Cane screwed them all over. Meanwhile, Nick (Joshua Morrow) will try to make Crystal (Morgan Obenreder) feel comfortable. He’ll take her to the office at The Underground and summon Chelsea (Melissa Claire Egan) to speak with her. Chelsea will figure out that this girl’s name is Crystal. Once Sharon (Sharon Case) arrives, she’ll realize this is the same Crystal she spoke with on the hotline. The Young and the Restless spoilers say Sharon will hope to reassure this distraught woman. Unfortunately, it appears the pep talk won’t help. When Sharon steps away to call Paul (Doug Davidson), Crystal will bolt. Near the pool bar, Ashley (Eileen Davidson) will have a chat with Zack (Ryan Ashton). He’ll work hard to impress her by speaking highly of Abby. Zack will also explain his plans for the new app. Later, Ashley will tell Abby that she approves. She’ll ask if things are going well, but Abby will confess that she’s scared of getting in too deep. The pain of the past is holding Abby back. At the television studio, Jordan (Darnell Kirkwood) will scold Hilary (Mishael Morgan) for taking Lily’s (Christel Khalil) commercial gig away from her. Hilary will point out that Lily hadn’t even gotten the job yet. She’ll wonder if Jordan cares about Lily more than he wants to admit. Jordan will suggest that maybe that’s true. However, he’ll quickly add that he’s not rooting for a “Lane” divorce. Hilary will contend that she’s not a damsel in distress like Jordan’s other projects. 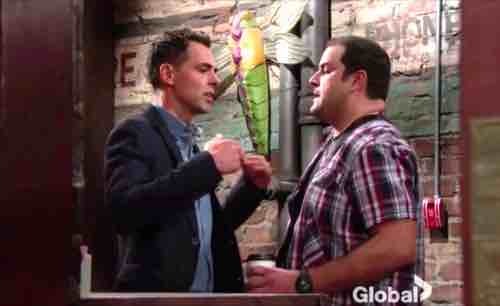 Y&R spoilers say they’ll share a kiss, so it seems they may be able to get past this for now. Will the situation shift once Cane and Lily separate? We’ll give you updates as other Young and the Restless details emerge. 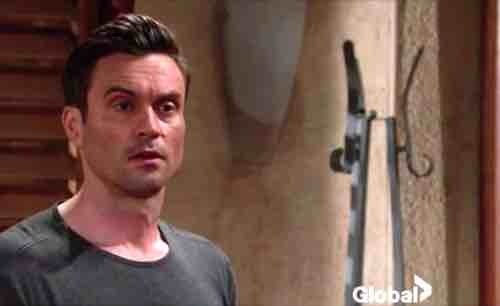 Stay tuned to Y&R and don’t forget to check CDL often for the latest Young and the Restless spoilers, updates and news. Sign up for our newsletter by clicking here and get the latest breaking soap news!